He was what a "star" should be. Looking at what some actors become it is sad. Here was a man overflowing with talent and beauty and he in turn filled the world with hope and beauty with his money, heart, passion fueling so many wonderful things. He has an equally talented wife who he stayed with- not going that embarrassing route some men go making fools of themselves in mid-life crisis with underage girls. He didn't squander his gifts and hard work stumbling drunk and drugged in and out of rehabs. I see men and women now who have talent and fame and they throw it away. 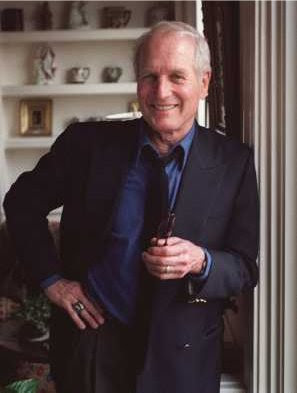 Paul Newman was truly a great man, he was what so many equally gifted men and women should be. Thank you for an example Paul, proof of what could be when someone has beauty and fame and money and how it can be used to make the world a better place, not just feed the tabloids with garbage. I am sad to see you go onward to whatever the afterlife is but you have an amazing legacy that proves fame and fortune do not have to be a curse but a blessing. Most actors leave behind little more than the sum of the parts they've played. Paul Newman spent 83 years proving that an actor can be a thinking organism whose importance can transcend even his greatest performances. Decades from now, Newman may be as highly regarded for his role in establishing camps for terminally ill children, and for donating $175 million in profits - and counting - from his Newman's Own food products to charity, as for all but the very finest of his movies. Newman's death Friday from cancer will doubtless provoke many written and televised valedictories, because he was a star in the grand American tradition: extremely handsome, but somehow uncomfortable with his handsomeness, which he attempted to subvert by playing a succession of engaging opportunists. Whether it was his signature performance as Fast Eddie Felson in Robert Rossen's The Hustler - one of the truly great post-war American movies - the utterly heartless title character in Hud, the main chance artist of Sweet Bird of Youth, the self-destructively rebellious Cool Hand Luke, or a gradually overmatched, more or less incompetent outlaw in Butch Cassidy and the Sundance Kid, Newman spent his prime starring years exposing the dark heart of narcissism in portrayals of relentless losers. Despite the flawed characters he delighted in playing, there was something wary and cynical about his persona; Newman was always alert for a con, even if it was a con he was running, as in the immensely popular The Sting. The odd thing was that even though Newman was fairly merciless in his choices, the public knew better; they treated him with the affection accorded the great movie stars of earlier eras because, even if Newman had the soul of a character actor, he had the looks of a classic leading man, and the attitude of an unpretentious guy next door. 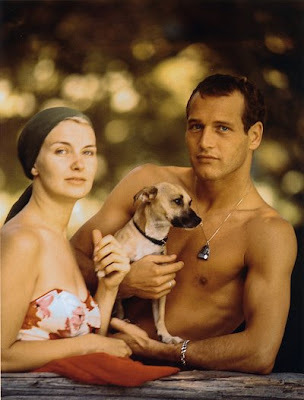 Initially, Newman was one of the hord of method actors who followed in the wake of Marlon Brando, to whom Newman had a physical resemblance. He tested for the part of James Dean's brother in East of Eden and lost out to the forgotten Richard Davalos. But when Dean was killed in a car crash in September 1955, Newman landed the part that Dean was to play next: the boxer Rocky Graziano in Somebody Up There Likes Me. After that he was off to the races, and even if he was an outrageously mannered Billy the Kid in The Left-handed Gun - a project that was also on Dean's dance card - the audience willingly followed him from film to film, from decade to decade. Later in his career, as he moved into character roles, he found more signature parts: an alcoholic lawyer in The Verdict, and, in one of his most fascinating performances, a hopelessly repressed Kansas lawyer in Mr. and Mrs. Bridge, which proved yet again that only an interesting man should play an uninteresting man. Any one of these performances could have won him his ridiculously delayed Academy Award for Best Actor, but he got it for encoring Eddie Felson in The Color of Money, a picture that wasn't close to being good enough to exist beside the original. His last great performance was as Sully in Robert Benton's Nobody's Fool, where he played an utterly unambitious but sharp-witted layabout of great charm and still simmering sexiness. No estimate of Newman should overlook his film directing career, which was not extensive but was distinguished. Special attention should be paid to Rachel, Rachel, a 1968 vehicle for his wife of 50 years, Joanne Woodward, and a very good version of Tennessee Williams' The Glass Menagerie, again starring Miss Woodward. Newman was not a faultless artist. He was oddly awkward at comedy, and helpless if asked to inhabit an essentially unwritten part. Roles calling for little more than glamour and charisma, such as Hitchcock's Torn Curtain, left him visibly irritated and at sea. And he had terrible dry periods: in the mid-70s alone, he made The Mackintosh Man, The Towering Inferno, Buffalo Bill and the Indians and Quintet. But no string of losers could dampen the affection audiences had for him, or diminish his casual power as an actor and a personality. One Day Free Pass to FaerieCon for my Readers!